Putting the public back in the process. If there is, we can&apos;t think of what it could be. Yet the history of debating in Utah is checkered at best. Too often, incumbents have cowered behind their advantage and refused to participate. Too often venues and distribution have been too small; topics covered, too narrow; time allotted, too short. In a word, political debates in Utah have been inconsistent. This week marks the beginning of an effort to improve that situation, to bring more public engagement to Utah&apos;s electoral process. On Tuesday and Thursday nights, the newly formed Utah Debate Commission will present its initial debates, the first between 1st Congressional District candidates Rob Bishop and Donna McAleer, the second between 2nd Congressional District candidates Luz Robles and Chris Stewart. Debates among the candidates for 3rd and 4th Congressional Districts, and Utah Attorney General will follow in coming weeks. The debates will take place on university campuses in different parts of the state in an effort to engage a broad swath of Utahns and a range of issues. They will be broadcast on television and radio, livestreamed on news websites, including sltrib.com, and covered by Utah&apos;s newspapers. Modeled after the Commission on Presidential Debates, the Utah commission is a nonprofit with a board comprised of university educators, community leaders and managers from news organizations, including The Salt Lake Tribune. The board is led by former state Sen. Scott Howell, a Democrat, and former U.S. Sen. Bob Bennett, a Republican. Bennett replaced former Gov. Olene Walker, who remains on the board, and is one of the group&apos;s guiding lights. In 2012, this headline appeared in The Tribune: "Mitt or not, Utah voter turnout was paltry." Embarrassingly low voter participation has been the rule in Utah since the mid 1990s. Before that, we were above the national average. Now we are near the bottom nationally. Possible reasons are many: Races perceived as non-competitive, so people think their votes don&apos;t matter; onerous voter registration rules; a caucus and convention system for picking candidates that excludes and alienates the vast majority of voters. 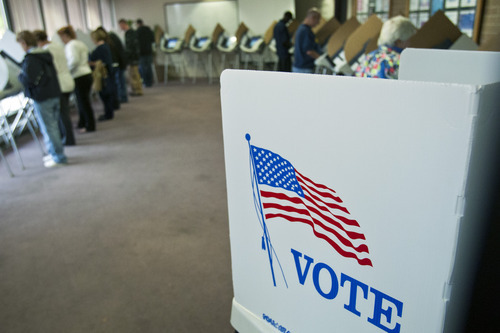 Efforts such as vote-by-mail, same-day registration in some counties, including Salt Lake County, and a way for candidates to circumvent the convention system have been enacted to help out. The debates beginning this week show that Utahns do have a decision to make, a choice between candidates who come to the issues from differing  sometimes widely divergent ­ perspectives. All debates live streamed at http://www.sltrib.com and broadcast on KSL radio.